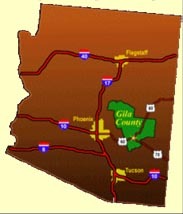 Gila County was created in 1881 from portions of Maricopa and Pinal counties, and later included part of Yavapai County. The county covers 4,752 square miles and is a source of great mineral wealth. The Globe Mining District, originally located on the San Carlos Indian Reservation, was reallocated to Gila County. Silver first attracted people to this area in the late 19th century. When the silver resources were depleted, copper emerged and has kept mining alive to this day. Globe is the county seat. Gila County is the home of the legendary Graham-Tewksbury feud, which began in the 1870s and lasted 15 years. It claimed dozens of lives and ignited tempers between cattle ranchers and sheep ranchers for years to come. Some of the attractions in Gila County include the Salt River Canyon, Tonto National Monument, Coolidge Dam, Roosevelt Dam and Roosevelt Lake. Both desert terrain and mountain ranges spread across the county's landscape. Elevations range from 2,000 to 7,000 feet above sea level. This stark difference of 5,000 feet enables the county to support ranching and timber production, as well as tourism and recreation. These four areas of commerce, in addition to copper production, comprise the county's major industries. All of Gila County is an Enterprise Zone. The U.S. Forest Service owns 55.5 percent of the land in Gila County Approximately 37 percent belongs to the Apache Tribe. Individuals and corporations own 3.7 percent of the land; the U.S. Bureau of Land Management, 1.9 percent; and the state of Arizona, 1 percent of the land. Send mail to info@globemiamichamber.com with questions or comments about this web site.